I have been eating roughly this same meal every St. Paddy's Day for practically my entire life. 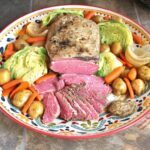 I can't complain: this make-ahead crockpot corned beef & cabbage is my easiest slow-cooker meal. Rinse the brisket well under cold water and pat dry with paper toweling. I always cut off most of the fat cap, but I leave that up to you. Place the potatoes, carrots, and onion in the bottom of a 6-qt. slow-cooker. Add the brisket, fat side up. Pour the Guinness around the beef and sprinkle with seasonings. Add the bay leaves and peppercorns. Lid the slow-cooker and set on low for a minimum of 10 hours and up to 12. After 8 hours, check the seasoning, adding salt and pepper as needed. Check the potatoes and carrots: remove if done. Cool and refrigerate overnight. During the last hour of cooking, add the cabbage and change slow-cooker setting to high. After an hour, remove the meat, cabbage, and juices. Remove any peppercorn or bay leaf cling-ons and discard. Cool and refrigerate overnight. Combine all vegetables, juices, and meat in a large Dutch oven and reheat on medium low. Remove meat when heated through and allow to rest for 10 minutes. Slice thinly against the grain and serve with carrots, potatoes, cabbage, and a dollop of Dijon mustard. Enjoy!